Hades. Picturesque and historic, Trieste remains one of the most popular destinations in Italy. Trieste is Trieste! A splendid city between the sea and the mountains. If you arrive by car and skip the first highway exit you wiil have the opportunity to see it from above, a really enchanting view, trieste is not so big however its important buildings make it be. Peoplefrom trieste like spending their free time at the sea, so theytake the opportunity of catching a little sun even where there is not properly a beach but only rocks in front of the sea. Only a short train ride from San Dona di Piave North is Trieste - a city and seaport in northeastern Italy just across the border from Croatia.In fact you can take a passenger ferry across to Croatia from Trieste. PASSENGER FERRIES to Rovinj and Pula from late June to early September, run by Trieste Lines. It is situated towards the end of a narrow strip of Italian territory lying between the Adriatic Sea and Slovenia, which lies almost immediately south and east of the city. Trieste is located at the head of the Gulf of Trieste and throughout history it has been influenced by its location at the crossroads of Latin, Slavic, and Germanic cultures. In 2009, it had a population of about 205,000 and it is the capital of the autonomous region Friuli-Venezia Giulia and the Province of Trieste. Trieste was one of the oldest parts of the Habsburg Monarchy. In the 19th century, it was the most important port of one of the Great Powers of Europe. As a prosperous seaport in the Mediterranean region, Trieste became the fourth largest city of the Austro-Hungarian Empire (after Vienna, Budapest, and Prague). In the fin-de-siecle period, it emerged as an important hub for literature and music. It underwent an economic revival during the 1930s, and Trieste was an important spot in the struggle between the Eastern and Western blocs after the Second World War. Today, the city is in one of the richest regions of Italy, and has been a great centre for shipping, through its port (Port of Trieste), shipbuilding and financial services. In 2012, LonelyPlanet.com listed the city of Trieste as the world's most underrated travel destination. Only a short train ride from San Dona di Piave North is Trieste - a city and seaport in northeastern Italy just across the border from Croatia.In fact you can take a passenger ferry across to Croatia from Trieste. PASSENGER FERRIES to Rovinj and Pula from late June to early September, run by Trieste Lines. It is situated towards the end of a narrow strip of Italian territory lying between the Adriatic Sea and Slovenia, which lies almost immediately south and east of the city. Trieste is located at the head of the Gulf of Trieste and throughout history it has been influenced by its location at the crossroads of Latin, Slavic, and Germanic cultures. In 2009, it had a population of about 205,000 and it is the capital of the autonomous region Friuli-Venezia Giulia and the Province of Trieste. Trieste was one of the oldest parts of the Habsburg Monarchy. In the 19th century, it was the most important port of one of the Great Powers of Europe. As a prosperous seaport in the Mediterranean region, Trieste became the fourth largest city of the Austro-Hungarian Empire (after Vienna, Budapest, and Prague). In the fin-de-siecle period, it emerged as an important hub for literature and music. It underwent an economic revival during the 1930s, and Trieste was an important spot in the struggle between the Eastern and Western blocs after the Second World War. Today, the city is in one of the richest regions of Italy, and has been a great centre for shipping, through its port (Port of Trieste), shipbuilding and financial services. In 2012, LonelyPlanet.com listed the city of Trieste as the world's most underrated travel destination. Walking through a labyrinth of hilly streets overlooking the azure Adriatic sea, I could not initially tell that Trieste used to be the fourth largest city in the Austro-Hungarian empire. Despite visiting on the finale of the World Cup in 2014, I sensed a sleepy summertime vibe, with neatly dressed sun worshippers dipping into decadent gelato or imbibing Trieste´s sweet alcoholic specialty, Aperol, on sprawling cafe patios. But a closer look at Trieste, situated only 70 kilometers from Venice and tucked into the Slovenian coast, revealed a multifaceted history of the unassuming city. Occupied by Romans, Habsburgs, Mussolini’s regime, Germans and Allied Forces, it was finally returned to Italy in 1954. This city has a fascinating history and culture, and despite being situated less than two hours from Venice, is often off the well-worn Italian tourism path. Visit if you can, and also see under-visited Slovenia, only a half hour drive away. Trieste is quiet, but very nice. Lazy, slow, almost no tourists. The beaches are pretty bad compared to other Mediterranean destinations, but they feel like an added bonus. The oldest seaport in the world. I visited there in 2007 and a pier was being built to accommodate cruise ships. The city was spectacular! The train station restrooms had been updated they now have flushing water for the holes. Trieste lies at the very edge of northeast Italy, wedged between Slovenia and the Adriatic Sea. It is amongst Italy's most unique cities and Mediterranean resorts, and much of its former Hapsburg grandeur is still apparent in its many imposing Neo-classical buildings and almost Eastern European atmosphere. 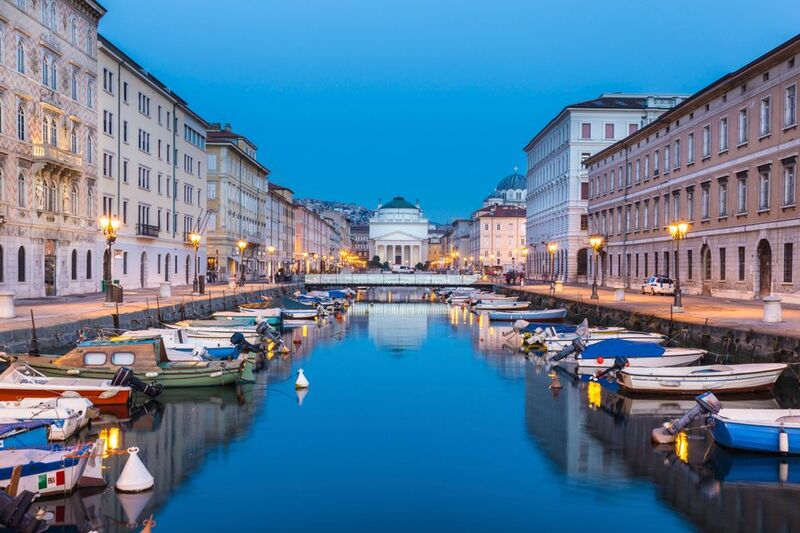 Trieste is not a love-at-first-sight tourist magnet like Florence or Venice, but rather more of a charming and understated city, albeit with some stunning architecture and beautiful scenic views of the Adriatic. I loved the blend between Austrian and Italian architecture. It was like Vienna by the sea. There are some beautiful castles along the coast, not to far from town. I left my heart in this city. It's truly magical and the people are kind.